This cave was discovered by coincidence in 1904 during works on the former local railway. 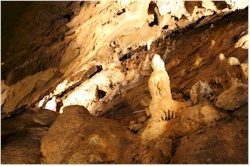 Pretty quickly, the cave was arranged to receive visitors and was given the name "la merveilleuse". The cave was created by a small underground river and consists of different chambers and corridors that connect those chambers with eachother. 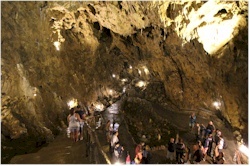 The cave has artificial light so that you can have a good view on the stalactites, stalagmites and petrified waterfalls. At the end of the Second World War, the cave served as a hiding place for civilians of Dinant until the liberation. 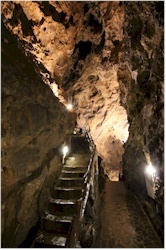 Due to the well maintained paved paths and the stairs, the cave looses some of its natural character but on the other hand, they make the cave very accessible. You cannot enter the cave by yourself; a guide can give you a tour that takes about a small hour. You do not need special shoes for this cave but you have to take into account that the temperature is around 12 to 13°C all year through. Suggestion: this is fun to do with kids. At the entrance/exit of the cave there is a small shop and a cafeteria. The cave is in walking distance of the railway station of Dinant. There is a parking for those who choose to go there by car.